Smartpen Math Ideas - Math think-alouds, talking flashcards and more! Smartpen math ideas are prevalent because math teachers were some of the first educators to dive in and implement Livescribe smartpens. The step-by-step nature of math problems also makes the linking of audio and notes extremely effective in math instruction. Math think-alouds are one of our all-time favorite smartpen math ideas, and providing out-of-the-classroom assistance to math students is made much easier with the use of a smartpen. Browse the smartpen math ideas below for some great smartpen implementation ideas for your classroom and feel free to share your smartpen math ideas with us! Use mathcasts as an alternative form of assessment by having students work out a problem in the notebook while audibly explaining the steps to the problem. Not only will you be able to see your students’ work but you can also assess their thinking process. Homework Helpers are short explanations of sample problems or techniques that can be recorded in the quiet of your own office. These helpful pencasts can be posted for students to access on your teacher website, blog, Moodle, or your school’s Learning Management System (LMS). In fact, the "Greater Than/Less Than" Homework Helper was actually recorded with a note to parents. These Homework Helpers are also a great way to involve parents in the learning process, by explaining the techniques students are being taught at school. If you are new to using a smartpen, Homework Helpers are a great place to start. They allow you to get comfortable recording with your pen and allow you to do it in a quiet environment with few distractions. Embed pencasts of the daily lecture notes into your teacher website or blog for students and parents to access at home. Parents have the opportunity to become involved in the learning process, and students can benefit from reviewing difficult concepts as many times as needed for understanding. Students can create pencasts of themselves solving and explaining a problem solution, thus tracking their fluency with the language of mathematics and their own understanding of the learning. Use these pencasts to generate a digital archive of pencasts available for students who miss class, to empower kids to teach each other, to further the idea of using multiple methods for finding a solution, and to engage students in the learning process. Add your voice (or sounds) to any document or object by adding your voice (or sound) to Livescribe audio dots or Sounds Stickers and adding them to your math vocabulary word wall. The Word Wall can even expand to include common theorems, postulates, etc. Students with reading difficulties can use the smartpen during independent practice or testing to listen to pre-recorded word problems or test questions. This allows students with reading difficulties to independently work through tests or worksheets without having to call on the teacher for assistance. The Livescribe 3D Recording Headset allow students to do this without disturbing or having to leave the classroom. Add sound stickers to flashcards that share tips for remembering basic math facts. Create talking flashcards for theorems, postulates, geometric shapes – anything that repeated audio is essential for the learner to remember concepts. 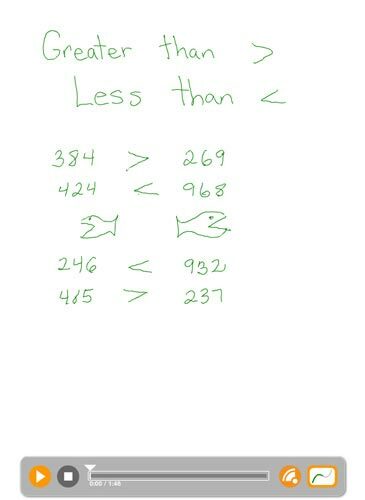 Create a skip counting activity that allows students to practice counting by 2s, 3s, 5s, etc. The smartpen can be used by the student to touch the dot under the picture of each set of object. Begin with the student saying the number with the pen. As they progress, challenge them to say the correct number before the pen does. The smartpen is a motivating tool in this activity. Encourage communication with students by answering student questions via email with a pencast. Use pre-recorded pencasts to create a learning environment that embraces the flipped classroom model. This model encourages students to learn at home at their own pace and free up class time for more meaningful problem solving and projects with the teacher. Pencasts make the instruction outside of the classroom a snap! We want your ideas for more smartpen math activities!